Ritual meals are an ancient human tradition, dating back at least 12,000 years. When it comes to Hermetic tradition, such as it is, the Asclepius or Perfect Discourse has vague instructions and a prayer for a ritual meal in its final chapter. 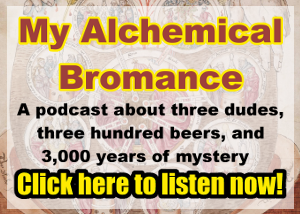 Alchemy is an ancient practice that can be considered in part as a precursor to chemistry. However, like Freemasonry, it can be said to have both a speculative and an operative side. While “operative” alchemy deals with the transformation of base metals into gold, “speculative” alchemy uses similar symbolism, allegory, and language to speak of spiritual truths and a path to inner light and wisdom. On Saturday, June 17th, I will be part of a panel discussion on grimoires. This panel is part of the quarterly speaker series at Esoterika Lodge #227 in Portland, Oregon. In January, the Portland Scottish Rite Valley started a monthly club night. I came up with an idea for a club to study Hermetic Qabalah as it’s presented in Morals & Dogma and the Scottish Rite degrees. This has been an incredible learning experience for me. I’ve been on a number of podcasts lately, so you should check these out and listen to some great conversations with a lot of really fascinating people.